Every fall, monarch butterflies migrate up to 3,000 miles to spend the winter in Mexico. Upon their return in the spring, monarchs need milkweed plants along their migration route to lay their eggs, because the plants are the only source of food their young will eat. Monarch butterflies face many challenges including: loss of breeding and food habitats along the migration route, weather and climate change, predators, pathogens, parasites and less overwintering habitat in Mexico. However, there are folks out there who are determined to keep the monarchs around. And according to the World Wildlife Foundation, there may be hope! Eastern Monarch population numbers have increased 144% from last year. The large population this year is an encouraging sign for monarchs, and an inspiration for us to continue our work together. 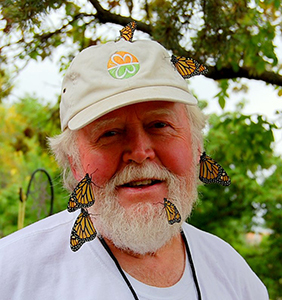 Orley “Chip” Taylor is the Founder and Director of Monarch Watch. Trained as an insect ecologist, Chip Taylor has published papers on species assemblages, hybridization, reproductive biology, population dynamics and plant demographics and pollination. Starting in 1974, Chip Taylor established research sites and directed students studying Neotropical African honey bees (killer bees) in French Guiana, Venezuela, and Mexico. In the mid 70s, Chip was working on bee research. His focus was mainly on the Africanized honey bees that were known to the public as "Killer Bees." In the early 90s, his interest turned to monarchs. The idea that the phenomenon of the monarch migration could be at risk of disappearing was a common lecture topic in his classrooms at the University of Kansas. Along with a school teacher in the area, he decided to begin tagging monarchs with the idea of gaining more knowledge about the monarch migration. Fred and Nora Urquhart had started tagging monarchs in 1937, and Chip felt like more knowledge could be gained by collecting more tagging data. The call to interested taggers was answered by over 1000 individuals from Dallas and Des Moines. The Monarch Watch Tagging Program is designed to help us understand the dynamics of the monarch's spectacular fall migration through mark and recapture. 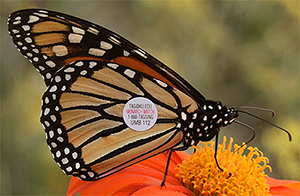 Tagging helps answer questions about the origins of monarchs that reach Mexico, the timing and pace of the migration, mortality during the migration, and changes in geographic distribution. It also shows that the probability of reaching Mexico is related to geographic location, size of the butterfly, and the date (particularly as this relates to the migration window for a given location). Each fall Monarch Watch distributes more than a quarter of a million tags to thousands of volunteers across North America who tag monarchs as they migrate through their area. These "citizen scientists" capture monarchs throughout the migration season, record the tag code, tag date, gender of the butterfly, and geographic location then tag and release them. At the end of the tagging season, these data are submitted to Monarch Watch and added to our database to be used in research.